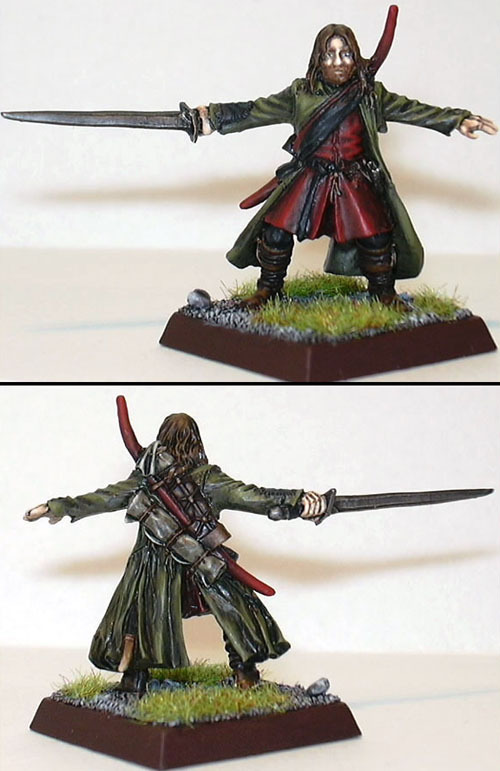 Aragorn - step by step. 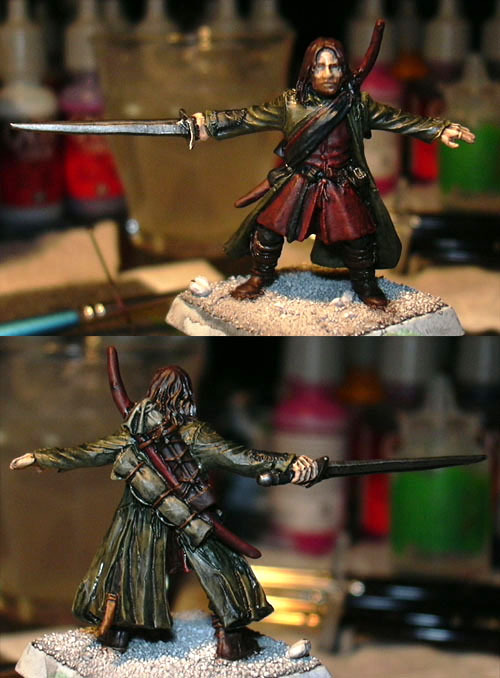 There are so many ways to go about painting a miniature. Depending on the quality you want and how much time you're willing to put into each miniature, it can be a widely different experience from miniature to miniature. I'm going to do my best to describe the techniques that I use when I want to create when I have "unlimited" time and I want to do a miniature to the very top of my skills. My skills are of course limited, as everybody else's I have been painting for a year now, and this is what I have learnt! Our little guinea pig for today is Aragorn from Games Workshop's box of "the fellowship" from Lord of the rings. Get your miniature out of it's package! Clean your miniature from flash and other flaws. Put it on it's base and put sand (or flock or whatever else you fancy) on the base, using PVA glue. Now you'll have a clean miniature, primed white, standing on white sand. Not very appealing to the eyes, is it? But appealing to your creative side, hopefully, yes? Seeing cleaned and primed miniatures makes my brush-fingers twitch with excitement, I can't wait to get started, so on we go to the first actual step in this painting guide. Step #1 - no fancy stuff here. Just put on all the primary colours like this. Any colours you like is fine, but the more thought you put behind the choice of colours, the better it will of course look in the end. 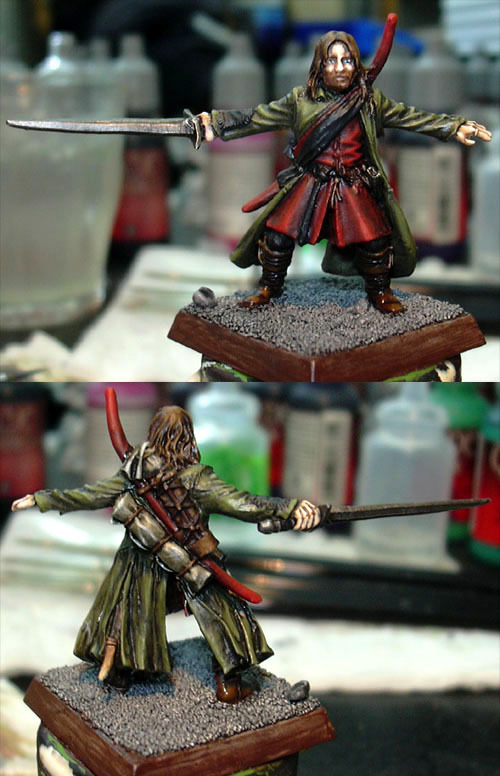 I've chosen browns, greens and reds here, because this is after all Aragorn - the ranger. He's used to running around in the forest and hunting and hiding (or whatever Aragorn likes to do in his spare time). I think it's generally a good idea to keep the colours together somehow. I don't like to use 10 different colours in the same model. 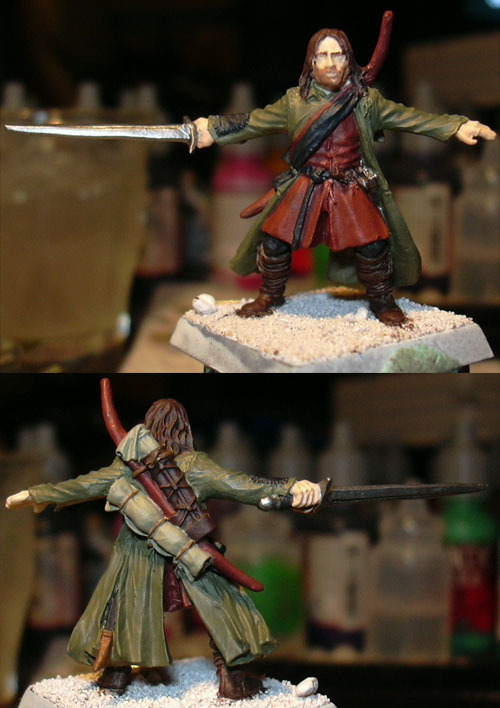 Using different shades of brown and green works well for this kind of model. Step #2 - I have used three colours of washes here; dark brown, dark green and black. I have applied these washes all over the model. 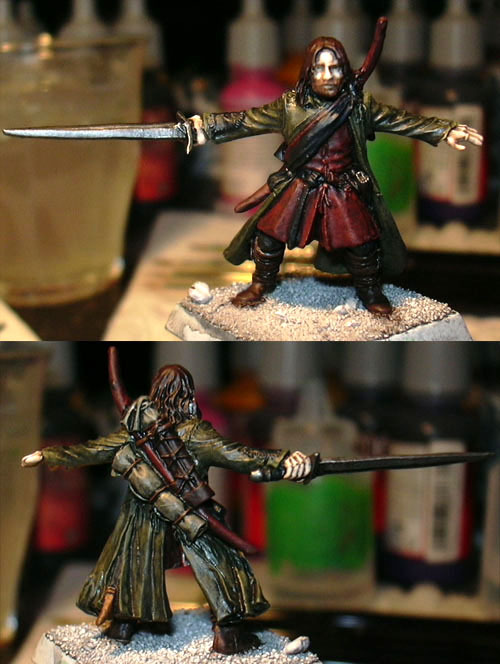 Dark green for the cloak and green bits, black for the brown areas and brown wash for the skin and on the red-brown. I have not used any inks for these washes. I've just used normal colours, thinned with water and acrylics flow improver. The amount of water and flow improver you want to add, varies depending on how deep you want the shadows to be. I have used very thin washes in several layers, rather than one less thin wash. Step #3 - this is the second phase of shading. I've let the first layer of washes dry and then applied further washes. 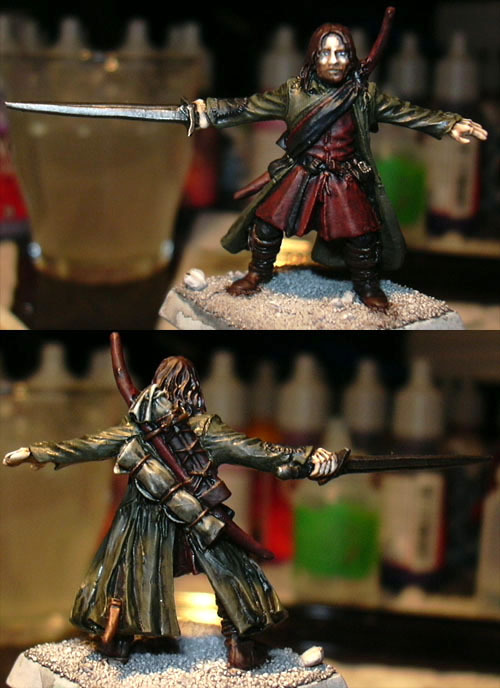 I then let those layers dry also, and used the black wash over the cloak as well as on the skin, to really get deep shades all over the model. The black wash is more thinned than the green and brown washes, to let the black shades sink further into all recesses. Step #4 - shading is finished now, so I go on to highlighting. I think it's always a good idea to add some drying retarder to your paint when you're doing highlights, because it makes blending MUCH easier! The drying retarder makes the colour more transparent and the highlights will become less harsh. I start by highlighting the face, with the original skin tone that I used for the base layer. I then highlight another 2 layers, with a few drops of skull white added to the mix. Step #5 - a good ranger needs eyes, right? The entire face and the eyes in particular are extremely important for the all over appearance of your model, so you want to avoid any major mistakes here! Painting eyes can be very tricky and requires a good brush. I painted small, white slits to begin with. I then painted the pupils with a very, very dark blue colour. This model is too small to paint any more detailed eyes than that, I believe. I also gave him eye brows and highlighted his bedroll-like thing that he's got on his back, as well as the cloth that sticks out from his quiver. Again, I lighlighted these green areas by just adding white to the original colour. 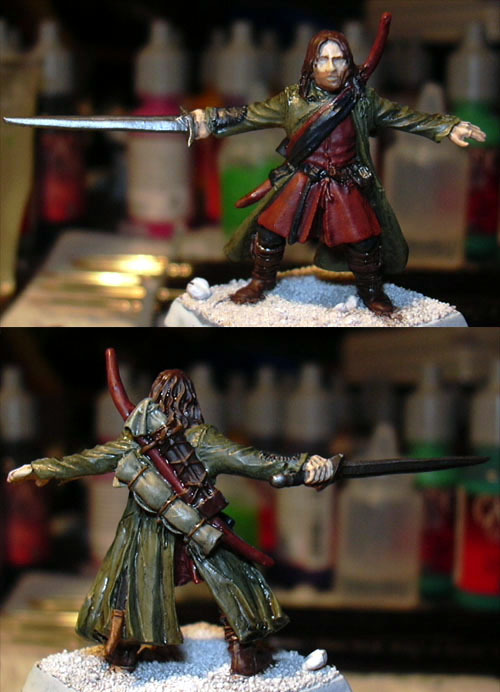 Step #6 - this is where I begin to highlight his outer cloak. 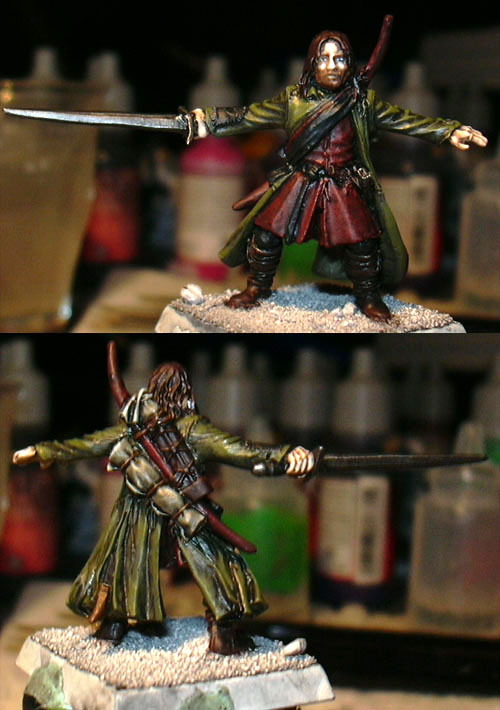 The original colour for this cloak was "russian uniform" which is a Vallejo model colour that is extremely similar to GW's "catachan green". I had to add some black to the "russian uniform" before I started to highlight this cloak, because the washes I applied earlier made it rather dark. After the first layer of highlighting, I added some bright green colour and a drop of yellow, to make it brighter. I then applied a second layer of highlights. 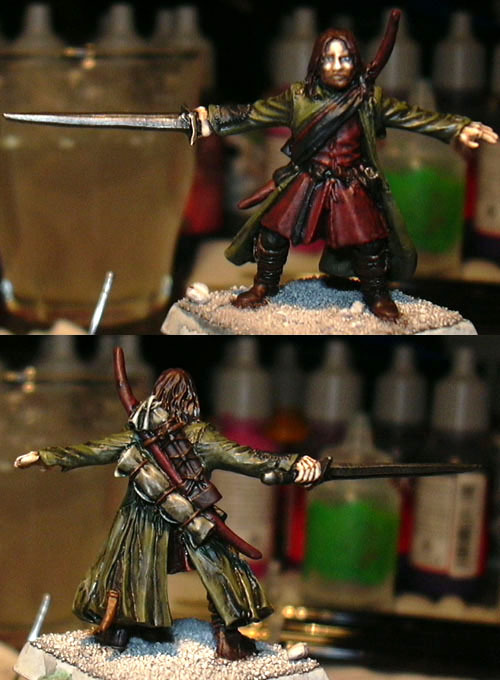 Step #7 - more highlighting on the outer cloak is done here. I add yellow to the green mix and I also add more drying retarder to the mix, to make sure that the highlights are applied softly and smoothly. You don't want to see the edges between each highlight, ideally. Dry retarder makes this much easier to achieve. After two more layers of highlighting on the cloak, I decide not to highlight it further. He's a ranger after all, he won't be running around in a shiny, neon-green cloak. So I want to keep it dark like this. Step #9 - I fixed some details here, like the little strings he's got all over that keeps his equipment together. 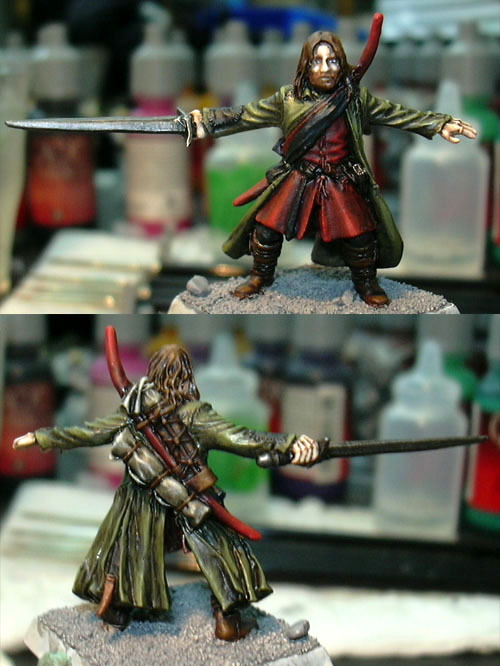 I also highlighted the sword scabbard he's got sticking out from his cloak. I shaded the stones he's standing on with several layers of black washes. I've started to paint the edges of the base with "scorched brown" because I think a brown edge looks nice. Step #10 - long and hard work, but it's finally done! I have added static grass to the base and drybrushed the stones with gray and then white. I also made sure the edges of the base had a good, solid layer of brown on it.